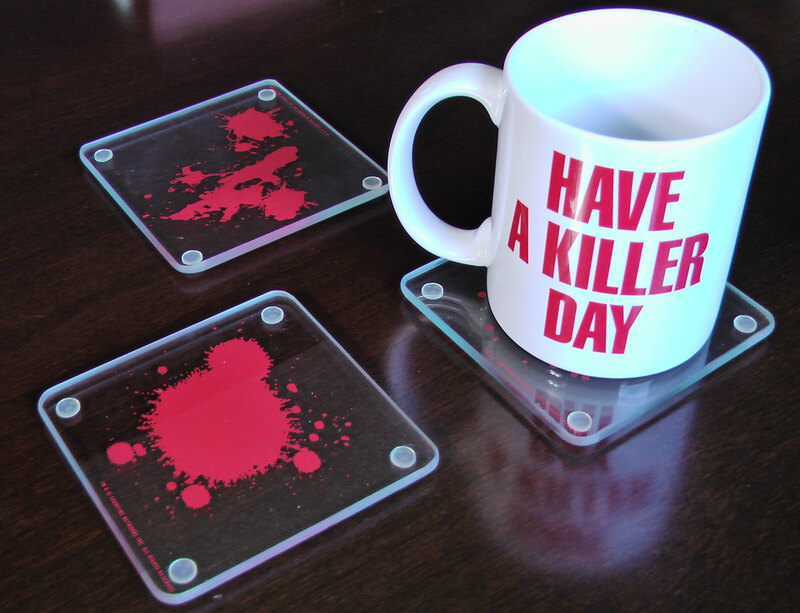 The Dexter Blood Slide coasters are one of the best Christmas gifts I received last year. The set includes six heavy duty glass coasters. 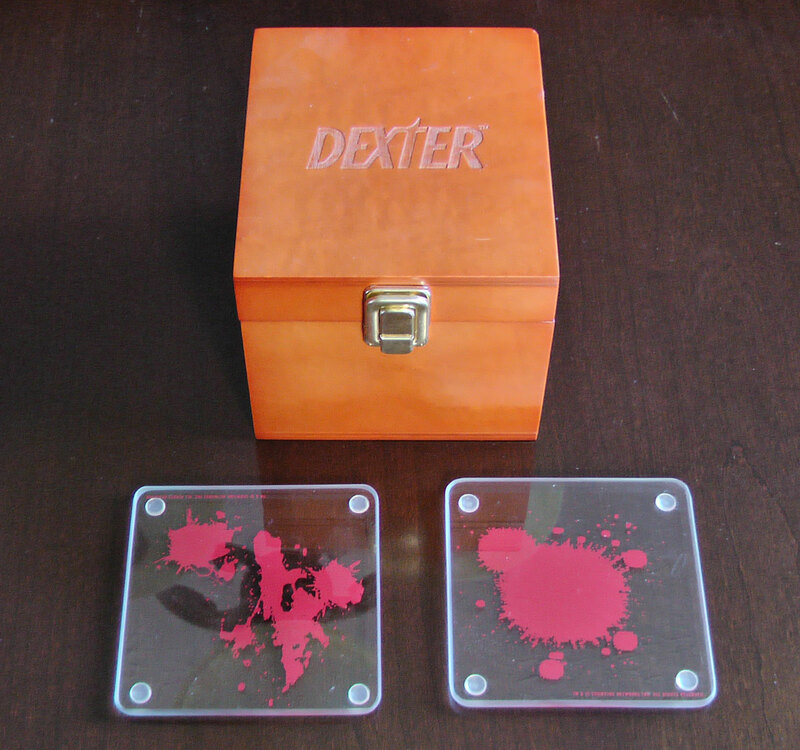 Each coaster is decorated with a unique blood splatter designed to resemble the blood slides that Dexter takes from his victims. The coasters have rubberized feet underneath to protect your furniture from scratches, and to prevent the coasters from sliding. This is an officially licensed Dexter collectible. 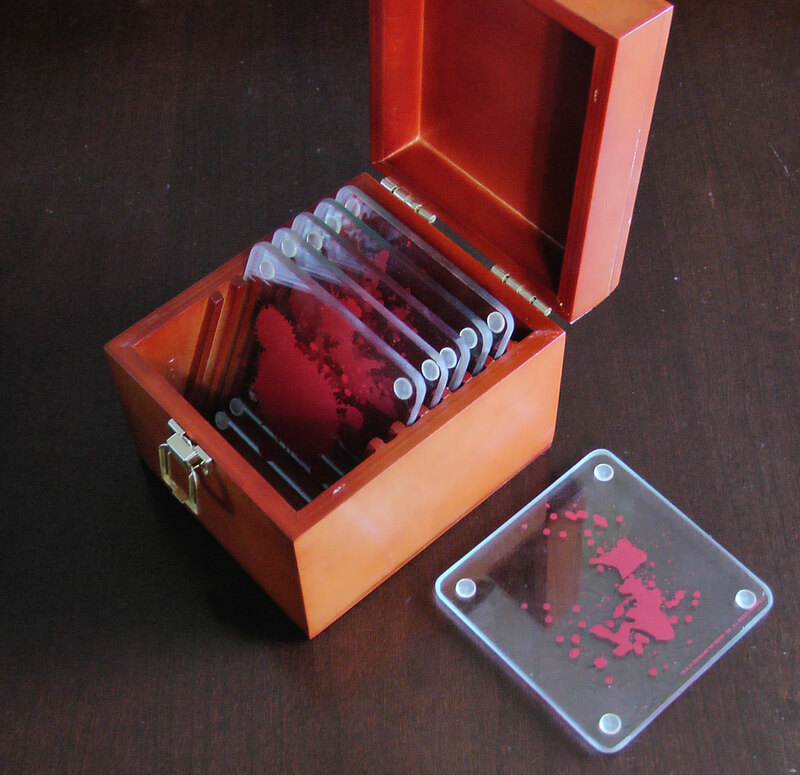 The coasters comes with a wooden trophy box that has the Dexter logo engraved on the lid. You will not want to hide this box in an air conditioner. The box itself looks great, but it does not have the same quality as the coasters. It’s faux wood. The texture can come unglued, and the box is fragile. There have been a many complaints about the box being damaged during shipping. When my box arrived a texture strip on the back side had fallen off and had to be re-glued. The coasters are great because they are functional and really cool looking. I use them daily in my home office. It was smart design concept to put the blood paint on the bottom of the coasters. If the blood was on the top it would eventually scrape off. The glass is thick and durable, and it’s safe to put hot or cold beverages onto the surface. The Dexter coaster set is wonderful décor for any Dexter premiere party, or Halloween party. Sick coasters! My wife and I are fans of the show. She would love these.